The Grand Island Memorial Library will be closed on Monday, January 17, 2005 due to the Martin Luther King holiday. December 21, 2004 . . .The Grand Island Memorial Library, while open for business in 2005, will see a reduction in hours. The Buffalo and Erie County Public Library system is facing a shortage of $4.2 million which will reduce library services county-wide. As part of this shortage, the Grand Island Memorial Library's budget allocation forced the library to reduce its hours of service. The library will be open 40 hours a week to meet the New York State minimum standard. Monday, 10 a.m. to 9 p.m.
December 15, 2004 . . .The Grand Island Memorial Library staff is pleased to announce that library patrons may once again check out materials and also place reserves on library materials. "A big thank you to the many, many Grand Island library users who advocated for our library during the recent budget crisis," Library Director Lynn A. Konovitz said this week. 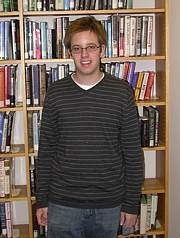 The library will be open in 2005, with new hours and the new schedule should be available next week. The Grand Island Memorial Library will be closed on December 24, 25, 31 and January 1 for the holidays. Kim Cich is shown (center) with her son. A "Make Your Own Graham Cracker Holiday House" project was presented Tuesday evening, November 30, 2004 by Explore & More - A Children's Museum and sponsored by the Friends of the Grand Island Library. The event took place in the library's community room and drew a fantastic turnout of holiday house builders. A special program for children ages 5 to 12 years old is being held at the Grand Island Memorial Library at 7 p.m., Tuesday, December 28, 2004. "All Aboard the Polar Express" will feature crafts, refreshments and a special reading of "The Polar Express." Registration begins Thursday, December 9 at 9 a.m. To register or for more information, call 773-7124 or sign up at the library. The Buffalo & Erie County Library has posted "After January 1, 2005: Your Library Will Close!" on its official website. Join advocates from across Erie County in a collective effort to keep OUR public libraries from closing in 2005! Click http://www.buffalolib.org/libraries/advocacy.asp for complete information. The Buffalo & Erie County Library has posted "After January 1, 2005: Your Library Will Close!" on its official website. Click "After Jan. 1, 2005" for this story. Scroll down for more information on the proposed closings. 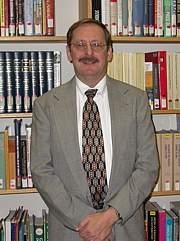 The following was received on Wednesday, November 10, 2004 by the Grand Island Memorial Library from the Buffalo & Erie County Library Director Michael C. Mahaney to be distributed to all staff: Everyone is working hard and hoping for the best possible outcome to the evolving 2005 budget crisis. Unfortunately, we also need to be prepared for the worst case if the County Executive's "Red" budget becomes reality. Please begin sharing this information with your patrons. These dates should serve as further inspiration for advocacy! You will receive card stock signage, 1 easel-back for your circulation desk and slingers to be distributed to all patrons. 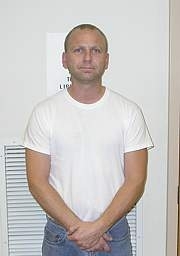 A press release will be distributed to all local media on Friday morning. Information will be posted on the website Friday morning as well. Thank you for your continued advocacy efforts! After January 1, 2005, the Grand Island Memorial Library could close. The proposed $18 million cut represents a 75% reduction from the $24 million in library property tax received from Erie County in 2004. Proposed cuts would result in most, if not all, libraries failing to meet State minimum standards, causing the potential loss of an additional $2.8 million in State Library Aid and the loss of state charters. All 52 libraries across Erie County, including the Grand Island branch, would be affected with severe cutbacks in hours and service or complete shutdowns. Click http://www.buffalolib.org/libraries/advocacy.asp, look for "Advocate For Your Library!" on the right side of the page, and share your concerns with local and State public officials. Click http://www.buffalolib.org/libraries/advocacy-boardmessage.asp for a very important message from the Buffalo & Erie County Public Library Board of Trustees.  Friday, Nov. 19 from 10 a.m.-5 p.m.
 Saturday, Nov. 20 from 10 a.m.-3 p.m. Buy a bag of books for $2 from 1 p.m. until closing on Saturday. All books are from the Grand Island Memorial Library collection. 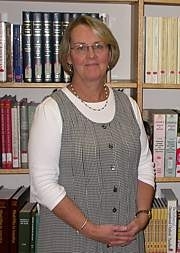 The Grand Island Memorial Library announces Election Day (Tues., Nov. 2, 2004) hours as 1-9 p.m. The Grand Island Memorial Library announces Veterans Day hours on Tuesday, November 11, 2004 are from 10 a.m. to 5 p.m. 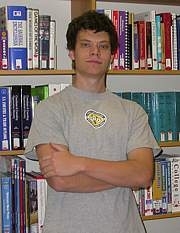 The Teen Book Club of the Grand Island Memorial Library will meet 7 p.m. Wednesday, November 17, 2004. The Club, open to all teens in grades 6 through 12, will discuss the book, Flame by Hilari Bell. For more information call the library at 773-7124. "Make Your Own Graham Cracker House" will be presented by Explore & More at the Grand Island Memorial Library 6:30 p.m., Tuesday, November 30, 2004. This program is for children ages 6 and older and adults. Younger children are welcome but must be accompanied by an adult. Registration is limited and begins Tuesday, November 9. To register or for more information, call 773-7124, or sign up at the Library. A special program for children ages 6 to 12 years old, featuring ghost stories by Mr. Salvatore Bordonaro, will be offered at the Grand Island Memorial Library 7 p.m., Tuesday, October 26, 2004. Refreshments will be served. Registration begins Thursday, October 14 by calling the library at 773-7124 or sign up at the library. For more information, call 773-7124. The Grand Island Memorial Library will hold an organizational meeting for its Teen Book Club 11 a.m. Saturday, October 9, 2004. All teens in grades 6 through 12 are invited to participate. Books will be selected for the coming year and other library activities will be planned. To register, or for more information, call 773=7124 or stop in at the library. The Grand Island Memorial Library announces special holiday hours for Columbus Day, Monday, October 11, 2004. The library will be open from 10 a.m. to 5 p.m. Preschool story hour will not be held on Columbus Day. The Grand Island Memorial Library's Fall Toddler Lap-Sit program, featuring stories, fingerplays and songs for children ages 18 months to 3 years, will be held from 10 a.m. to 10:30 a.m. Fridays. Each child must be accompanied by an adult caregiver. Registration begins Thursday, September 30, 2004 at 9 a.m. For more information or to register, call 773-7124 or sign up at the library.  Monday from 10 a.m. to 9 p.m.
 Tuesday, Wednesday and Thursday from 1-9 p.m.
 Friday and Saturday from 10 a.m. to 5 p.m. The fall session of Preschool Story Hour begins Monday, September 20, 2004 at the Grand Island Memorial Library. Weekly programs of stories, songs, crafts and games are open to children 3 to 5 years old. Children must be 3 years of age before September 2004. Programs one hour in length are offered on Mondays from 10:30-11:30 a.m., or Wednesdays, 1:30-2:30 p.m. Registration begins 9 a.m. Wednesday, September 13 at the library or by calling 773-7124. Please specify which session you prefer. The Grand Island Memorial Library will be closed on Monday, July 5, 2004 in observance of Independence Day. For the remainder of the week, the Library will be open on Tuesday, Wednesday and Thursday from 1-9 p.m. and from from 10 a.m. to 5 p.m. on Friday. The Library is closed on Saturday and Sunday. The Grand Island Memorial Library's Summer Toddler Lap-Sit program, featuring stories, fingerplays and songs for children ages 18 months to 3 years with a grown-up for each child, will be held from 10 a.m. to 10:30 a.m. Fridays beginning July 16, 2004 and continuing through August 13, 2004. Registration begins Tuesday, June 22, 2004 at 9 a.m. Call the library at 773-7124 or come in and sign up. The summer session of Preschool Story Hour at the Grand Island Memorial Library will begin Monday, July 12, 2004 and continue through August 9, 2004. Weekly programs of stories, songs, crafts and games are open to children 3 to 5 years old. Children must be 3 years of age before July 2004. Programs one hour in length are offered on Mondays from 10-11 a.m., or from 11:15-12:15 p.m. Registration begins 9 a.m. Tuesday, June 22, 2004 at the library or by calling 773-7124. There is a limit of two names per phone call. The Grand Island Memorial Library is offering several programs that will encourage children to read and enjoy books during the summer months. The library is participating in the "Read, White & Blue" 2004 New York State Summer Reading Program. "Read, White & Blue" Read-To-Me Club for children 1 to 6 years of age and their family beginning Monday, July 12, 2004 has no regular meeting time. Children and an adult visit the library each week to select books to read at home. On their first visit they will receive a reading calendar to fill out and return each week to earn stickers for the books read. Erie Canal Boaters is open to children entering grades 1-2 in September. Programs are held from 2-3:15 p.m. Tuesdays from July 13 to August 17 and include stories, games, and crafts. Children will receive a reading chart to complete and other premiums for participating the program. Underground Railroaders is open to children entering grades 3-6 in September. Programs are held from 2-3:15 p.m. Thursdays from July 15 to August 19 and include stories, games, and crafts. Children will receive a reading chart to complete and other premiums for participating the program. Registration for these programs begins Tuesday, June 15. Participants may sign up in person at the Library or by calling 773-7124. All children participating in the summer programs are eligible to attend our Summer Celebration on August 19, 2004 at the Library. Tuesday, Wednesday, Thursday, 1-9 p.m. The library is closed on Saturdays beginning June 19, 2004, through the Labor Day holiday. The spring session of Preschool Story Hour at the Grand Island Memorial Library will begin Monday, May 3, 2004 and Wednesday, May 5, 2004. Weekly programs of stories, songs, crafts and games are open to children 3 to 5 years old. Children must be 3 years of age before May 2004. Programs one hour in length are offered on Mondays from 10:30-11:30 a.m., or Wednesdays, 1:30-2:30 p.m. Registration begins 9 a.m. Tuesday, April 27, 2004 at the library or by calling 773-7124. There is a limit of two names per phone call. The Grand Island Memorial Library's Spring Toddler Lap-Sit program, featuring stories, fingerplays and songs for children ages 18 months to 3 years with a grown-up for each child, will be held from 10 a.m. to 10:30 a.m. Fridays beginning May 7, 2004. Registration begins Friday, April 30, 2004 at 9 a.m. Call the library at 773-7124 or come in and sign up. Grand Island Memorial Library will be closed on Good Friday, April 9, 2004 and will re-open Saturday, April 10, 2004 from 10 a.m. to 5 p.m. The Grand Island Memorial Library will be open special hours, from 10 a.m. to 5 p.m., on Patriots' Day, Monday, February 16, 2004. The Preschool Story Hour will not be scheduled for February 16. The Grand Island Memorial Library's Preschool Story Hour is up and running for Winter 2004. The Monday morning class is filled to capacity but for those interested, the Wednesday afternoon 1:30 class has openings. The children start the hour singing the "Hello Song." Books and crafts follow a weekly theme and this week's theme was "snow." The children decorated a snowman at craft time and listened to books and a video about snow. 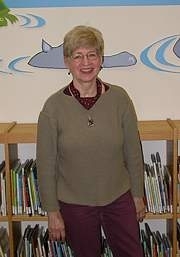 New Childrens Librarian Ann Marie Basso will be in charge of the program with help from Donna Jayme and Marilynne Smith. This program is for children ages 3-5. Call the Library, 773-7124, to register. The Grand Island Memorial Library announces special hours for the Martin Luther King holiday, Monday, January 19, 2004. The library will be open from 10 a.m. to 5 p.m. No Preschool Story Hour will scheduled for the holiday. The winter session of Preschool Story Hour begins Monday, January 12, 2004 at the Grand Island Memorial Library. Weekly programs of stories, songs, crafts and games are open to children 3 to 5 years old. Children must be 3 years of age before September 12, 2004. Programs one hour in length are offered on Mondays from 10:30-11:30 a.m., or Wednesdays, 1:30-2:30 p.m. Registration begins 9 a.m. Monday, January 5 at the library or by calling 773-7124. There is a limit of two names per phone call. Regular hours resume Friday, January 2, 2004: Monday, 10 a.m. to 9 p.m.; Tuesday, Wednesday and Thursday, 1-9 p.m.; Friday and Saturday, 10 a.m. to 5 p.m.
To usher in Children's Book Week (November 16-22) at the Grand Island Memorial Library, come to "Sing a Story, Read a Song" with Nan Hoffman whose family concert will be performed from 1:30-2:30 p.m. on Saturday, November 15, 2003. Sign up at the Library or call the library at 773-7124. The Grand Island Memorial Library announces Election Day (Tues., Nov. 4, 2003) hours as 1-9 p.m.
A Used Book Sale will be held on Friday, November 21 and Saturday, November 22, 2003 in the Community Room of the Grand Island Memorial Library, 1715 Bedell Road. Sponsored by the Friends of Grand Island Memorial Library, the sale is a great place to find many beautiful, �gently used� book treasures. All of the items have been donated and the proceeds will be used to purchase books and equipment for the library. Throughout the sale, a blue canvas bag with the library logo may be purchased and filled with the books of your choice for $15. A bid table containing special items will be part of the sale with bids closing at 12:30 p.m. on Saturday. "You will be notified if you are the lucky new owner of a bid book," a spokesman for the Friends of the Library said this week. The sale starts on Friday, November 21 for Friends of Grand Island Memorial Library members only from 5�7 p.m. Individual memberships are $3 or life membership for $35; family memberships are $5 or life membership for $50 and all are available at the door. From 7-9 p.m. on Friday there is a $.50 admission charge. On Saturday the sale runs from 10 a.m. until 3 p.m. with free admission and you may fill a bag with books for two dollars from 1-3 p.m. The Grand Island Memorial Library announces Veterans Day hours on Tuesday, November 11, 2003 are from 10 a.m. to 5 p.m.
An evening of Scary Stories and frightful tales told by Scary Sal and Nervy Nancy will be offered for children in grades 2-6 at the Grand Island Memorial Library from 7-8 p.m., Tuesday, October 28, 2003. Children are invited to wear their Halloween costumes and will enjoy some Halloween treats. Sign up in the library or call 773-7124. An After-School Halloween Craft program for children in grades K-5 will take place from 4-5 p.m., Wednesday, October 22, 2003 at the Grand Island Memorial Library. Sign up in the library or call 773-7124. The Grand Island Memorial Library announces special holiday hours for Columbus Day, Monday, October 13, 2003. The library will be open from 10 a.m. to 5 p.m. Preschool story hour will not be held on Columbus Day. "Are you doing the Fall Cleaning and finding your book shelves overflowing?" The Friends of Grand Island Memorial Library will hold book drops on Saturdays until and including November 15, 2003. "This is an excellent chance for you to clean up your bookshelves and donate books to the Friends for their upcoming book sale, scheduled for November 21 and 22, 2003," a spokesman for Friends of the Library said this week. Donations are to be brought to the library. Those unable to bring donations on Saturdays, may bring them anytime that the library is open. Island residents are urged to save Campbell�s Soup labels for library projects. A collection box is in the children�s section at the library. For those unable to get to the library but wanting to borrow materials, they can be delivered to Island residents. Call the library at 773-7124 for more information. The Grand Island Memorial Library's Fall Toddler Lap-Sit program, featuring stories, fingerplays and songs for children ages 18 months to 3 years, will be held from 10 a.m. to 10:30 a.m. Fridays beginning October 17, 2003. The program, with a grown-up for each child, runs for four weeks. Registration begins Wednesday, October 8, 2003 at 9 a.m. Call 773-7124 after 9 a.m. or sign up at the library. The fall session of Preschool Story Hour begins Monday, September 15, 2003 at the Grand Island Memorial Library. Weekly programs of stories, songs, crafts and games are open to children 3 to 5 years old. Children must be 3 years of age before September 15, 2003. Programs one hour in length are offered on Mondays from 10:30-11:30 a.m., or Wednesdays, 1:30-2:30 p.m. Registration begins 9 a.m. Wednesday, September 8 at the library or by calling 773-7124. There is a limit of two names per phone call. Grand Island Memorial Library will be closed Monday, September 1, 2003. The library returns to normal operating hours after the holiday and will be open Saturday, September 6 from 10 a.m. to 5 p.m. Regular hours are Monday, 10 a.m. to 9 p.m.; Tuesday, Wednesday and Thursday, 1-9 p.m.; and Friday and Saturday, 10 a.m. to 5 p.m. 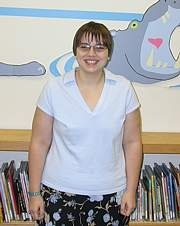 The summer session of Preschool Story Hour at the Grand Island Memorial Library will begin Monday, July 14, 2003. 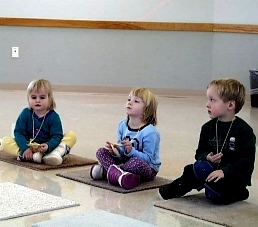 Weekly programs of stories, songs, crafts and games are open to children 3 to 5 years old. Children must be 3 years of age before July 14, 2003. Programs one hour in length are offered from 9:45-11 a.m. on Mondays. Registration begins 9 a.m. Tuesday, July 1, 2003 at the library or by calling 773-7124. There is a limit of two names per phone call. The Grand Island Memorial Library's Summer Toddler Lap-Sit program, featuring stories, fingerplays and songs for children ages 18 months to 3 years, will be held from 10 a.m. to 10:30 a.m. Fridays beginning July 18, 2003 through August 8, 2003. The program, requiring a grown-up for each child, runs for four weeks. Registration begins on Monday, July 9, by calling 773-7124 after 9 a.m. Registration is also being taken at the Library, 1715 Bedell Road. The Grand Island Memorial Library is offering several programs that will encourage children to read and enjoy books during the summer months. The library is participating in the "Picture This, Imagine That -Read!" 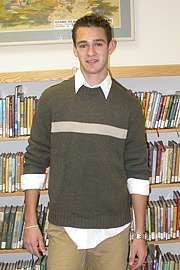 2003 New York State Summer Reading Program. Petite Artistes Read-To-Me Club for children 1 to 6 years of age and their parents and family beginning Monday, July 7, 2003 has no regular meeting time. Children and an adult visit the library each week to select books to read at home. On their first visit they will receive a reading calendar to fill out each week to earn colors for their palettes. Imagineers Summer Reading Club is for independent readers completing grades 1 to 5 and has no set meeting time. Beginning Monday, July 7, children may visit the library at any time to select books and pick up their Imagineer Bingo Game Card. Perform a chosen activity each week to win the game! Picture Perfect Readers is open to children entering grades 1-2 in September. Programs are held from 2-3:15 p.m. Tuesdays from July 8 to August 12 and include stories, games, and craft activities. Children will receive a reading chart to complete and other premiums for participating the program. Designers is open to children entering grades 3-6 in September. Programs are held from 2-3:15 p.m. Thursdays from July 10 to August 14 and include stories, games, and craft activities. Children will receive a reading chart to complete and other premiums for participating the program. Registration for these programs begins Wednesday, June 11. Questions may be directed to 773-7124. ALL CHILDREN PARTICIPATING IN THESE SUMMER PROGRAMS ARE ELIGIBLE TO ATTEND THE LIBRARY'S CELEBRATION ON AUGUST 14, 2003. The library is closed on Saturdays beginning June 21, 2003, through the Labor Day holiday. The Grand Island Memorial Library will participate in the 5th Annual Battle Of The Books Summer Reading Program and competition for students entering 6th, 7th, 8th or 9th grade in the Fall of 2003. Each team member will read at least two of the six selected book titles. The second meeting featuring Stargirl by Jerry Spinelli is from 2-3:30 p.m. Wednesday, July 2, 2003. One title will subsequently be discussed and practiced from 2-3:30 p.m. on each Wednesday in July. For more information, or to sign up call 773-7124 or visit the library. Enrollment is limited. The Grand Island Memorial Library will be closed for the Memorial Day holiday on Monday, May 26, 2003. The library will re-open on Tuesday, May 27th, during normal business hours 1-9 p.m. The Grand Island Memorial Library's Spring Toddler Lap-Sit program, featuring stories, fingerplays and songs for children ages 18 months to 3 years, will be held from 10 a.m. to 10:30 a.m. Fridays beginning May 9, 2003. The program, with a grown-up for each child, runs for four weeks. Register by calling 773-7124 after 9 a.m.
Each team member will read at least two of the six selected book titles. The first meeting featuring A Wrinkle in Time by Madeleine L'Engle is from 1-2:30 p.m. Saturday, May 17, 2003. Grand Island Memorial Library will be closed on Good Friday, April 18, 2003 and will re-open Saturday, April 19, 2003 from 10 a.m. to 5 p.m.
An Easter Egg Decorating Program to celebrate the spring season will take place at the Grand Island Memorial Library from 2-3 p.m. Thursday, April 17, 2003. The program, sponsored by the Friends of the Grand Island Memorial Library, is for children in grades K-6. Those registering (stop at library or phone 773-7124) are asked to bring one (or more) hard-cooked or hollow egg. All other materials will be provided. Library Celebrates "National Library Week"
A children's program, Library Pals Read-Aloud, will help to celebrate National Library Week at the Grand Island Memorial Library. The Read-Aloud takes place from 6:30-7:15 p.m. Tuesday, April 8, 2003 and is geared for children in grades K and up. "Wear your pajamas if you want." Refreshments will be served. To register, call the library at 773-7124 or stop in. The program is sponsored by the Friends of the Grand Island Library. A Used Book Sale will be held on Friday, March 28 and Saturday, March 29, 2003 in the Community Room of the Grand Island Memorial Library, 1715 Bedell Road. It is sponsored by the Friends of Grand Island Memorial Library and is a great place to find many beautiful, �gently used� book treasures. All of the items have been donated and the proceeds will be used to purchase books and equipment for the library. Throughout the sale, a blue canvas bag with the library logo may be purchased and filled with the books of your choice for $15. A bid table containing special items will be part of the sale with bids closing at 12:30 p.m. on Saturday. "You will be notified if you are the lucky new owner of a bid book," a spokesman for the Friends of the Library said this week. The sale starts on Friday, March 28 for Friends of Grand Island Memorial Library members only from 5�7 p.m. Individual memberships are $3 or life membership for $35; family memberships are $5 or life membership for $50 and all are available at the door. Admission charge from 7�9 p.m. on Friday is $.50. Saturday's sale runs from 10 a.m. until 3 p.m. with free admission and a "fill-a-bag with books" will be featured from 1-3 p.m. for two dollars. For further information, call the Library, 773-7124. The Grand Island Memorial Library announces special hours for the President's Day holiday, Monday, February 17, 2003. The library will be open from 10 a.m. to 5 p.m. No Preschool Story Hour will scheduled for the holiday. How Many Ways Can You Say "I Love You"?? Come and make Valentines with the Grand Island High School International Club at the Grand Island Memorial Library from 4-5 p.m. Tuesday, February 11, 2003. The program is for children in grades K-5 who will enjoy fun, Valentines and snacks. Register at the library or by calling 773-7124. Are your book shelves overflowing? The Friends of Grand Island Memorial Library will hold book drops on Saturdays until March 22, 2003. This is a chance for you to clean up your bookshelves and donate books to the Friends for their upcoming book sale, scheduled for March 28 and 29. Bring your donations to the library. Also, please save Campbell�s Soup labels for library projects. Collection box is in the children�s section at the library. If you are unable to get to the library but want to borrow materials, they can be delivered to you. Call the library at 773-7124 for more information. 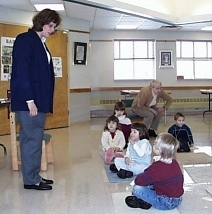 January 16, 2003 . . .The Grand Island Memorial Library's Winter Toddler Lap-Sit program, featuring stories, fingerplays and songs for children ages 18 months to 3 years, will be held from 10 a.m. to 10:30 a.m. Fridays beginning February 7, 2003. Each child must be accompanied by a grown-up. Registration begins on Friday, January 31 by calling 773-7124 after 9 a.m. The Grand Island Memorial Library announces special hours for the Martin Luther King holiday, Monday, January 20, 2003. The library will be open from 10 a.m. to 5 p.m. No Preschool Story Hour will scheduled for the holiday. January 6, 2003 . . .The Friends of the Library will hold book drops on Saturdays beginning January 11 and continuing through March 22, 2003. Residents are urged to clean out bookshelves and donate the books to the Friends for their upcoming book sale slated for March 28 and 29. In addition, the Friends are requesting Campbell Soup labels to be used for library projects. A collection box for the labels is in the children's section at the library. Those wanting to borrow library materials but are unable to get to the library should called 773-7124 for delivery information. 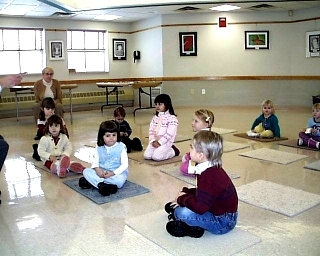 The winter session of Preschool Story Hour at the Grand Island Memorial Library will begin Monday, January 13, 2003. Weekly programs of stories, songs, crafts and games are open to children 3 to 5 years old. Children must be 3 years of age before January 13, 2002. Programs one hour in length are offered on Mondays from 10:30-11:30 a.m., or Wednesdays, 1:30-2:30 p.m. Registration begins 9 a.m. Wednesday, January 6 at the library or by calling 773-7124. There is a limit of two names per phone call. Regular hours resume Thursday, January 2, 2003: Monday, 10 a.m. to 9 p.m.; Tuesday, Wednesday and Thursday, 1-9 p.m.; Friday and Saturday, 10 a.m. to 5 p.m.
A Winter Holiday Craft Program is scheduled at the Grand Island Memorial Library from 4-5 p.m. Tuesday, December 17, 2002. The program is for children in grades K-5. Sign up may be made in the library or by calling 773-7124. Cathleen Connelly, a retired art teacher, will be featured at the Grand Island Memorial Library during Children's Book Week. 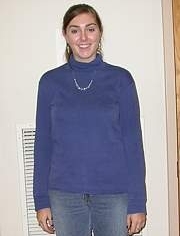 She will present a "Make a Scrapbook" program for children in grades K-6 at 4 p.m. Tuesday, November 19, 2002. Parents are welcome if space permits. Those attending should bring a few items of their own such as photos, drawings, and poems to put in their scrapbooks. Register at the library by calling 773-7124 or by signing up in the library. The Grand Island Memorial Library announces Veterans Day hours on Monday, November 11, 2001 are from 10 a.m. to 5 p.m. The regularly scheduled preschool story hour will not be held on the holiday. The Wednesday, November 13 story hour will take place as usual, from 1:30-2:30 p.m. 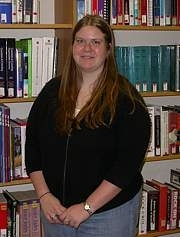 The Grand Island Memorial Library announces Election Day (Tues., Nov. 5, 2002) hours as 1-9 p.m. The Friends of the Grand Island Memorial Library will hold a Discard Book Sale 10 a.m. to 5 p.m. Friday, November 15, 2002 and 10 a.m. to 3 p.m. Saturday, November 16, 2002 in the library's Community Room, 1715 Bedell Road. Attendees will be able to buy a bag of books for one dollar from noon until closing on Saturday. All books are from the Grand Island Memorial Library collection. Youngsters in Kindergarten through the fifth grade were invited to attend a craft workshop on Wednesday, October 23, 2002 at the Grand Island Memorial Library. Education Director Kay Rogers and her helpers assisted the youngsters in making pumpkins with crepe paper trailers, decorated masks to wear and Halloween cards to send to friends. About 30 participants were busy for the full hour's workshop and they were rewarded with the finished products to take home and a special ring and stickers as gifts. Because some of the helpers were "dressed up," we are not sure who had the most fun. Come listen to Scary Stories, an evening of Frightful tales told by Scary Sal Bordonaro and Nervy Nancy at the Grand Island Memorial Library from 7-8 p.m. Thursday, October 29, 2001. Children in grades 2-6 are invited to wear their Halloween costumes, and will enjoy some Halloween treats. Sign up at the library or call 773-7124. An After-School Halloween Craft program for children in grades K-5 will take place from 4-5 p.m., Wednesday, October 23, 2002. Sign up in the library or call 773-7124. The Grand Island Memorial Library announces special holiday hours for Columbus Day, Monday, October 14, 2002. The library will be open from 10 a.m. to 5 p.m. Preschool story hour will not be held on Columbus Day. The Grand Island Memorial Library's Summer Toddler Lap-Sit program, featuring stories, fingerplays and songs for children ages 18 months to 3 years, will be held from 10 a.m. to 10:30 a.m. Fridays beginning July 12, 2002. The program, requiring a grown-up for each child, runs for four weeks. Registration begins on Monday, July 1, by calling 773-7124 after 9 a.m. Registration is also being taken at the Library, 1715 Bedell Road. The Grand Island Memorial Library is offering several programs that will encourage children to read and enjoy books during the summer months. The library is participating in the Splish-Splash Read! 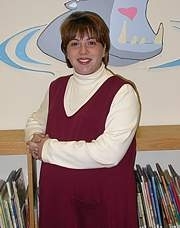 2002 New York State Summer Reading Program. Rubber Ducky Read-To-Me Club for children 1-6 years of age and their parents and family begins Monday, July 8, and has no regular meeting time. Children and an adult visit the library each week to select books to read at home. On their first visit, they will receive a reading calendar and begin to fill out each week. Divers Summer Reading Club is for independent readers completing grades 1 to 5 and has no set meeting time. Beginning Monday, July 8, children may visit the library at any time to select books and pick up their "aquarium." They return each week and receive fishes for books read. Beachcombers is open to children entering grades 1-2 in September. Programs are held from 2-3:15 p.m. Tuesdays from July 9 to August 13 and include stories, games, and craft activities. Children will receive a reading chart and other premiums, together with a certificate of achievement for completing the program. Surfers is open to children entering grades 3-6 in September. Programs are held from 2-3:15 p.m. Thursdays from July 11 to August 15 and include stories, games, and craft activities. Children will receive a reading chart, and other premiums, together with a certificate of achievement for completing the program. Registration for these programs begins Wednesday, June 12. Questions may be directed to 773-7124. ALL CHILDREN PARTICIPATING IN THESE SUMMER PROGRAMS ARE ELIGIBLE TO ATTEND THE CELEBRATION ON AUGUST 15, 2002. Erie County Legislator Charles M. Swanick (D-Kenmore/Grand Island) has announced an exciting new opportunity for children to board the �cyber train� this summer. Offered by the Buffalo and Erie County Public Library System, the Grand Island Memorial Library will offer Cyber Camps for students entering grades 4 through 8 in the fall. Parents may choose either four morning sessions (Tuesday, August 20 through Friday, August 23, 2002 from 9 a.m. � 12 p.m.) or four afternoon sessions (Monday, August 19 through Thursday, August 22 from 1:00 p.m. � 4:00 p.m.) Children will engage in fun exploration of the Internet, database and software programs. The campers will utilize lap-top computers purchased as a part of a $1 million Educational Technology Grant sponsored by the Legislature in 2000. To register, participating students must have either a library card with parental permission for Internet access, or a parent must sign the registration form giving students permission to participate. Registration is free and students may register, beginning June 10th, at the Library, 1715 Bedell Road, 773-1724. The library is closed on Saturdays beginning June 15, 2002, through the Labor Day holiday. The Grand Island Memorial Library will be closed for the Memorial Day holiday on Monday, May 27, 2002. The library will re-open on Tuesday, May 28th, during normal business hours 1-9 p.m. 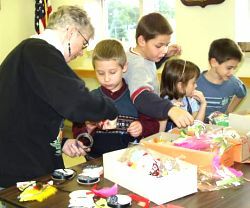 The spring session of Preschool Story Hour at the Grand Island Memorial Library will begin Monday, May 6, 2002. Weekly programs of stories, songs, crafts and games are open to children 3 to 5 years old. Children must be 3 years of age before May 6, 2002. Programs one hour in length are offered on Mondays from 10:30-11:30 a.m., or Wednesdays, 1:30-2:30 p.m. Registration begins 9 a.m. Wednesday, April 29, 2002 at the library or by calling 773-7124. There is a limit of two names per phone call. The Grand Island Memorial Library's Spring Toddler Lap-Sit program, featuring stories, fingerplays and songs for children ages 18 months to 3 years, will be held from 10 a.m. to 10:30 a.m. Fridays beginning May 10, 2002. The program, with a grown-up for each child, runs for four weeks. Registration begins on Friday, May 3, by calling 773-7124 after 9 a.m.
A Used Book Sale will be held on Friday, April 19 and Saturday, April 20, 2002 in the Community Room of the Grand Island Memorial Library, 1715 Bedell Road. Sponsored by the Friends of Grand Island Memorial Library, it is a great place to find many beautiful, �gently used� book treasures. All of the items have been donated and the proceeds will be used to purchase books and equipment for the library. The sale starts on Friday, April 19 for Friends of Grand Island Memorial Library members only (individual memberships are $3; family: $5 and both are available at the door) from 5�7 p.m. and with a $.50 admission from 7�9 p.m. The sale runs from 10 a.m. until 3 p.m. on Saturday with free admission and attendees may fill a bag with books for one dollar from 1 � 3 p.m. A bid table containing special items will be part of the sale with bids closing at 12:30 p.m. on Saturday. The Friends of Grand Island Memorial Library will hold book drops on Saturday, April 6 and April 13. "This is a chance for you to clean up your bookshelves and donate books to the Friends for their book sales," a spokesman for the group said this week. Friends members will be available from 10 a.m. to 2 p.m. both Saturdays to accept your donations. A Used Book Sale is schedule for April 19-20. Residents are also asked to save Campbell's Soup labels for library projects. Collection box is in the children's section at the library. For those who are unable to get to the library but want to borrow materials, they can be delivered by calling the library, 773-7124. 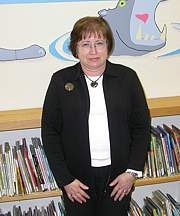 To usher in National Library Week, April 14-20, 2002, residents are invited to the Grand Island Memorial Library to hear Meri Lee Debany, storyteller extraordinaire from 1:30-2:30 p.m. on Saturday, April 13, 2002. The program, sponsored by the Friends of the Grand Island Library, is for children in grades K-6. To register, stop by the library or call 773-7124. "Fun"Tastic Saturday with the Library Pals, a program supported by the Friends of the Grand Island Memorial Library, will be held at the Library, 1715 Bedell Road, from 1:30 p.m. to 2:30 p.m. Saturday, March 23, 2002. Children in kindergarten through 6th grade are invited to join the Library Pals for a Spring Fling egg decorating craft. Those attending are asked to bring a few had-cooked or hollow eggs. All other materials will be provided. Register at the library or call 773-7124. The Grand Island Memorial Library will be open special hours, from 10 a.m. to 5 p.m., on Patriots' Day, Monday, February 18, 2002. The Preschool Story Hour will not be scheduled for February 18. "Fun"Tastic Saturday, supported by the Friends of the Grand Island Memorial Library, will be held at the Library, 1715 Bedell Road, from 1:30 p.m. to 2:30 p.m. Saturday, February 9, 2002. Children in kindergarten through 6th grade are invited to join the Library Pals to create a Valentine. Register at the library or call 773-7124. The Grand Island Memorial Library's Winter Toddler Lap-Sit program, featuring stories, fingerplays and songs for children ages 18 months to 3 years, will be held from 10 a.m. to 10:30 a.m. Fridays beginning February 1, 2002. The program, with a grown-up for each child, runs for four weeks. Registration begins on Friday, January 25, by calling 773-7124 after 9 a.m. The Grand Island Memorial Library announces special hours for the Martin Luther King holiday, Monday, January 21, 2002. The library will be open from 10 a.m. to 5 p.m. No Preschool Story Hour will scheduled for the holiday. The winter session of Preschool Story Hour at the Grand Island Memorial Library will begin Monday, January 7, 2002. Weekly programs of stories, songs, crafts and games are open to children 3 to 5 years old. Children must be 3 years of age before January 7, 2002. Programs one hour in length are offered on Mondays from 10:30-11:30 a.m., or Wednesdays, 1:30-2:30 p.m. Registration begins 9 a.m. Wednesday, January 2 at the library or by calling 773-7124. There is a limit of two names per phone call. Regular hours resume Wednesday, January 2, 2002: Monday, 10 a.m. to 9 p.m.; Tuesday, Wednesday and Thursday, 1-9 p.m.; Friday and Saturday, 10 a.m. to 5 p.m.
A Winter Holiday Craft Program is scheduled at the Grand Island Memorial Library from 4-5 p.m. Wednesday, December 19, 2001. Hosted by the Library Pals, the program is for children in grades K-5. Sign up may be made in the library or by calling 773-7124. Friends of the Grand Island Memorial Library will hold a Used Book Sale Friday, November 16 and Saturday, November 17 at the Library on Bedell Road. A members only (memberships available at door) sale will take place from 5-7 p.m. Friday and the sale will be open to the public (50 cent donation) from 7-9 p.m. Friday. The book sale will be open from 10 a.m. to 3 p.m. on Saturday with a Fill-a-Bag sale for a dollar from 1-3 p.m.
To celebrate "National Children's Book Week," the Grand Island Memorial Library is featuring the "Master of Mystery" from 4-5 p.m. Wednesday, November 14,2001. The magic show program is for children in grades K-5. Registration may be made at the library or by calling 773-7124. The Grand Island Memorial Library announces Election Day (Tues., Nov. 6) hours as 1-9 p.m. The Library's Veterans Day hours on Monday, November 12, 2001 are from 10 a.m. to 5 p.m. The regularly scheduled preschool story hour will not be held on the holiday. The Wednesday, November 12 program will take place as usual, from 1:30-2:30 p.m.
An After-School Halloween Craft program for children in grades K-5 will take place from 4-5 p.m, Wednesday, October 24, 2001 and will be hosted by the Library Pals. Sign up in the library or call 773-7124. Come listen to 'Scary Stories For Halloween,' spinetingling stories told by Sal Bordonaro at the Grand Island Memorial Library from 7-8 p.m. Thursday, October 25, 2001. Children are invited to wear their Halloween costumes, and will enjoy some Halloween treats. Sign up at the library or call 773-7124. Members of the Friends of Grand Island Memorial Library will hold a book drop on Saturday, October 13, 2001 and on all Saturdays through November 10, 2001. "This is a chance for you to clean up your bookshelves and donate books to the Friends for their book sales" A Used Book Sale is scheduled for November 16 and 17, 2001. The Grand Island Memorial Library announces special holiday hours for Columbus Day, Monday, October 8, 2001. The library will be open from 10 a.m. to 5 p.m. The regularly scheduled preschool story hour will not be held on the holiday. The Wednesday, October 10 program will take place as usual, from 1:30-2:30 p.m. The fall session of Preschool Story Hour begins Monday, September 17, 2001 at the Grand Island Memorial Library. Weekly programs of stories, songs, crafts and games are open to children 3 to 5 years old. Children must be 3 years of age before September 17, 2001. Programs one hour in length are offered on Mondays from 10:30-11:30 a.m., or Wednesdays, 1:30-2:30 p.m. Registration begins 9 a.m. Wednesday, September 12 at the library or by calling 773-7124. There is a limit of two names per phone call. Grand Island Memorial Library will be closed Monday, September 3. The library returns to normal operating hours after the holiday and will be open Saturday, September 8 from 10 a.m. to 5 p.m. Regular hours are Monday, 10 a.m. to 9 p.m.; Tuesday, Wednesday and Thursday, 1-9 p.m.; and Friday and Saturday, 10 a.m. to 5 p.m. The Grand Island Memorial Library's Summer Toddler Lap-Sit program, featuring stories, fingerplays and songs for children ages 18 months to 3 years, will be held from 10 a.m. to 10:30 a.m. Fridays beginning July 20, 2001. The program, with a grown-up for each child, runs for four weeks. Registration begins on Friday, July 13, by calling 773-7124 after 9 a.m. The summer session of Preschool Story Hour at the Grand Island Memorial Library will begin Monday, July 9, 2001. Weekly programs of stories, songs, crafts and games are open to children 3 to 5 years old (3 years of age before July 9). Programs one hour in length are offered at 9:45 a.m. and 11:00 a.m. Monday mornings. Registration begins on Monday, July 2, starting at 9:00 a.m. There is a limit of two names per phone call. The Buffalo and Erie County Public Library System is offering a Cyber Camp at the Grand Island Memorial Library during the week of August 27, 2001. The program, an exciting new opportunity for children to board the �cyber train� this summer, is for students entering grades 4 through 8. Participants will engage in fun exploration of the Internet, database and software programs. The campers will utilize laptop computers purchased as a part of a $1 million Educational Technology Grant sponsored by the Legislature last year. The classes will be taught by college students specializing in computer technology and hired with an additional $100,000 approved this year by the Legislature. Parents may choose from four morning sessions (Tuesday, August 28, through Friday, August 31, from 9 a.m.�noon) or four afternoon sessions (Monday, August 27, through Thursday, August 30, from 1:30 p.m.�4:30 p.m.). A commitment is required to attend either all four morning or all four afternoon sessions. To register, participating students must have either a library card with parental permission for Internet access, or a parent must sign the registration form giving students permission to participate. Registration is free, and students may register at the library. The same program, as well as one-day sessions, will be offered at several other branch libraries off the Island. For more information, call the library at 773-7124, or visit the library during normal summer hours. The Grand Island Memorial Library is offering several programs that will encourage children to read and enjoy books during the summer months. The library is participating in 2001: A READING ODYSSEY, a New York State Summer Reading Program. Wanderers Read-To-Me Club for children 1-6 years of age and their parents and family begins Monday, July 9, and has no regular meeting time. Children and an adult visit the library each week to select books to read at home. On their first visit, they will receive a reading calendar and begin to "pack their trunk." Adventurers Summer Reading Club is for independent readers completing grades 1 to 5 and has no set meeting time. Beginning Monday, July 9, children may visit the library at any time to select books and pick up their "travel kit." They return each week and receive "souvenirs" for books read. Travelers is open to children entering grades 1-2 in September. Programs are held from 2-3:15 p.m. Tuesdays from July 10 to August 14 and include stories, games, and craft activities. Children will receive bookmarks, a reading chart, and other premiums, together with a certificate of achievement for completing the program. Questers is open to children entering grades 3-6 in September. Programs are held from 2-3:15 p.m. Thursdays from July 12 to August 16 and include stories, games, and craft activities. Children will receive bookmarks, a reading chart, and other premiums, together with a certificate of achievement for completing the program. Registration for these programs begins Wednesday, June 13. Questions may be directed to 773-7124. The library is closed on Saturdays beginning June 16, 2001, through the Labor Day holiday. "Fun"Tastic Saturday, sponsored by the Friends of the Grand Island Memorial Library, will be held at the Library, 1715 Bedell Road, on Saturday, May 12. Children in kindergarten through 6th grade are invited to join the Library Pals to celebrate Mother's Day. Register at the library or call 773-7124. Friends of the Grand Island Memorial Library presented $10 gift certificates for Barnes and Noble to the winners of their "Vote For Your Favorite Book Contest." Winners are Heather Mollois, Emilie Kovacs, Brendan Stone, Rebecca Lynn Sturniolo, Jessica Varnes, Katie Samland, Maria Eltagouri, Lauren Fonte, Jamie Sobieski, Kristy Knickerbocker, Andrea Nicolia, Allison Pottner, Sheree Tamaklo, Andrea DeRosa, Kelsey Mash, Jessica Sturniolo, Jill Endres, Kelly Knickerbocker, Candace Santana and Mike Sobieski. Grand Island Memorial Library will be closed on Good Friday, April 13 and will re-open Saturday, April 14 from 10 a.m. to 5 p.m. 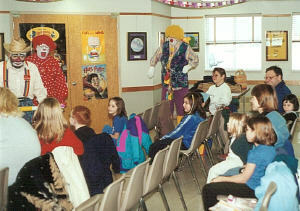 The Buffalo Zoo Conservation Clowns entertained a dozen small children at the Grand Island Memorial Library Monday, February 19, 2001. The clowns sung and told stories about the values of recycling, conservation, and how to care for pets. At the end of the hour-long show children were given little blue heart stickers bearing the letters I Y Q. When one child read the letters, the clown replied "I wike you too." April is National Library Month. The library is offering two special events. Pizza and PJ's Story Time, 6:30-7p.m. April 3 is for children grades one and up. Participants will be treated to a story, snack, and craft. The library presents its Funtastic Saturday Spring Fling for children K- 6 from 2-3:00 p.m April 7. Participants should bring at least one hard-boiled egg. Advance registration is required for both events. For more information stop in at 1715 Bedell Road or call the library at 773-7124. An introductory presentaton of a new internet instruction program was given at the Grand Island Memorial Library Tuesday evening, December 12 where attendees were told library users will be able to expand their use of resources and computer-based services available through the library system. Mary Ann Ozimek was the instructor. Cyber Train, the $1 million training program to begin in the Buffalo & Erie County Public Library system in 2001, is a traveling classroom consisting of eight laptop computers connected to a wireless network. The program, that will rotate throughoutout the Buffalo and Erie County library system including Grand Island, offers instruction in how to get started using the internet, how to use the different toolbar buttons, how to "browse" the internet and how to find specific information on the web. 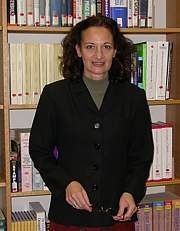 Although the laptops use Microsoft Internet Explorer 4.0, Ms. Ozimek noted that most browsers had similar setups. For more information, call the Office of Community Relations, 858-7182.